The oldest geological formation in Malaysian is on Pulau Langkawi (Langkawi Island). This geological formation is the Machinchang formation, formed about 550 to 505 million years ago (geological age - middle to late Cambrian Period). The formation consists of sandstone with some mudstone and conglomerate. The name Machinchang (sometime referred to as Mat Cincang) is derived from the long serrated quartzite ridge of five peaks that makes up the formation – the word cincang in Malay means ‘chopped-up’. The formation extend over the north-western part of Pulau Langkawi, where Gunung Machinchang (Mount Machinchang) is located. It also forms part of Pulau Rebak Besar and Pulau Jemuruk. A clear view of Mount Machingcang and the surroundings is seen from the Oriental Village - where you get to take the cable car up the mountain. Langkawi is a good place to have a shopping holiday. A must visit - a cable car ride up Mount Matchinchang and a walk over the top of the hill. Indulge in many water-based or beach activity to occupy your leisure time. Diving or snorkelling into the depths of the sea around Pulau Payar. Sample local Malaysian food and fresh sea food or visit open markets or the pasar tani and pasar malam. 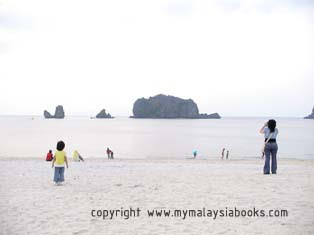 These two mountains in Langkawi Gunong Machinchang (on the western part of Langkawi island, state of KEDAH) and Gunong Raya tell the tale of a feud between two families of giants. Legend tells of Mat Raya's son wanting to marry Mat Cincang's daughter. Despite Mat Cincang’s opposition, the marriage took place. During the wedding feast, a fight broke out between the two familes. 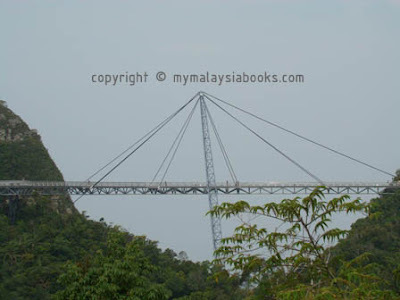 It is said that Mat Chinchang and Mat Raya were turned into mountains by the Langkawi Gedembai who witness the fight. During the fight, a large pot of gravy broke and its contents flowed onto the ground. Where the gravy spilt, became know as Kuah (the town) . Where the engagement ring was hurl became known as Tanjung Cincin (Cape of the Ring). Kampung Kisap (kisap means seep through) is the name of the village where the gravy seeped into the land. It is believed that the Hot Springs at Air Hangat is the site where a cauldron of hot water was broken and spilled. Mat Cincang and Mat Raya was transformed into the the two mountains. 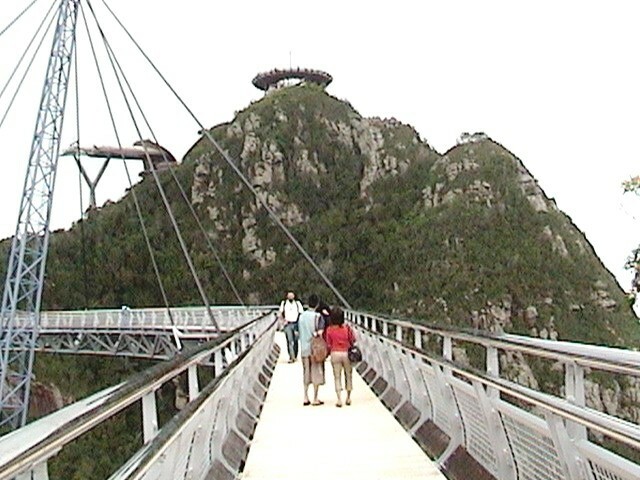 Travellers to Langkawi must visit Mount Machinchang. You can get up the mounain by cable car from the Oriental Village. The more adventurous can hike from the Seven Wells to the Panaroma bridge at Mount Machinchang or gunung Machinchang. 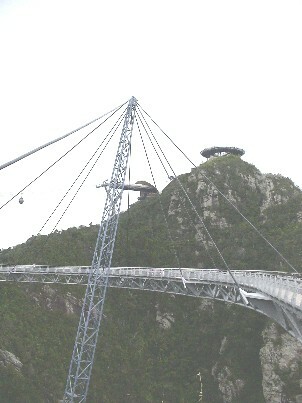 Most visitors will take the cable car - just for the experience. By cable care -- Stop at the first station up there to look aroungd but be sure to go to the second station to walk the Panaroma bridge. Be sure to visit Gunung Machinchang and you can be assured of an exciting experience! If you are travelling to Malaysia and Singapore this March 2008, be aware of the school holidays in Malaysia and Singapore. For the first term 2008, the school holidays in both countries clash! --- from 8 March to 16 March. 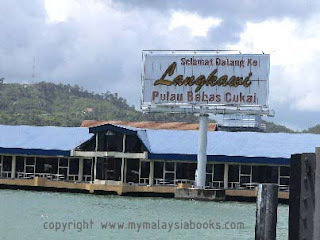 Visitors to Langkawi --- make your holiday arrangements early! Good hotels are difficult to get and flights from KL or Singapore are often fully booked. Before booking, compare hotel rates online. 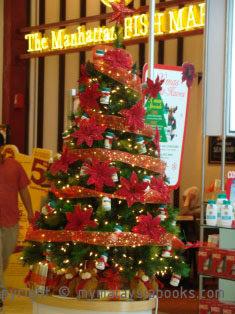 From Christmas to New Year 2008 is the super peak season in Langkawi.